Speculation runs rife regarding whether the negative terminal of a vehicle’s battery should be disconnected before welding on that vehicle. The reasoning is that it helps to prevent damage to the vehicle’s ECU and other electronics. Many people believe the negative terminal should be disconnected but cannot explain why it should be done. Other people believe disconnecting the battery terminal has no impact on the ECU since the ECU is still connected on both terminals and the affect of disconnecting the battery only isolates the battery and nothing else. They believe the idea to disconnect is simply an old wives’ tale with no valid reasons to substantiate it. So who is right? To help explain what’s happening we need to understand a couple of principles: Ohm’s Law and Kirchhoff’s Circuit Laws. I’m going to explain them very simply as they relate to this problem. Ohm’s Law: This is usually presented as the formula V= iR where V is voltage, i is current and R is resistance. It tells us that voltage is required for current to flow. If there is current flowing through a conductor then there must be a voltage across that conductor. Kirchhoff’s Circuit Laws: This law states that the sum of the voltages around a continuous electrical loop must be zero and the sum of the currents into and out of an electrical node is zero. Regardless of the current flowing, regardless of parallel or alternative loops, the voltages around every unique loop must sum to zero and the currents through each node must sum to zero. This is analogous to, if you walk around a track which has varying elevation, no matter what route you take on that track and what levels of elevation you reach, if you end up at the same spot you started then your net elevation change is zero. Or if many people are walking into an intersection where you can turn left or right, then the sum of the people going left plus people going right is equal to the number of people who entered the intersection. Below is a circuit diagram that depicts welding a vehicle. On the left is welding with the negative battery terminal connected and on the right is welding with the negative battery terminal disconnected. The resistor represents the car body. I have assumed the car battery voltage is 12V and the welder voltage is 100V. The actual voltages are irrelevant. The point is to see whether welding could damage the ECU and whether disconnecting the negative battery terminal would reduce that risk. All voltages are measured with respect to the battery’s negative terminal. The box labelled “ECU” is the engine control unit or engine management. This is the device we are trying to protect. V1 is the voltage across the ECU with the negative battery terminal connected whilst welding. V2 is the voltage across the ECU with the negative battery terminal disconnected whilst welding. Kirchhoff’s laws and Ohm’s laws resolve the voltage at each point. The left side has a closed loop through the ECU where Kirchhoffs voltage law easily verifies the voltage across the ECU. The right side has an open loop where Kirchoff’s current law dictates that no current flows through the ECU and Ohm’s law determines that the voltage across the ECU is zero. Similarly Ohm’s law could be used in isolation with the open circuit interpreted as an infinite resistance. We see that in the left circuit the ECU is suffering from overvoltage and could be damaged. It is designed for 12V yet has 112V across it. The right circuit, with the negative battery terminal disconnected, there is no voltage across the ECU and therefore it does not experience any overvoltage. But welders produce less than 100 volts you say? It doesn’t matter. I would have liked to use “x” for battery voltage and “y” for welder voltage and shown V1 > V2 but that might have been difficult to follow. The voltages are irrelevant. The point is V1 > V2. You might think that the metal sheeting of a car body is such a good conductor that it will never be able to generate any significant voltage drop at the current levels typical of welding. What about all the transitions and joins, for example where a door bolts onto the main body? Or the body bolts onto the chassis? What is the capacitance, inductance and overall impedance of the car body? Impedance describes the complex ratio between voltage and current for alternating currents. When you first strike the welder it yields a step function which would generate a reaction different to what the steady state DC resistance would predict. A step function is made up of many high frequency components. Not only are there many high frequencies present, but the voltage would be high when first striking the arc. Before welding starts the voltage floats up to the open circuit voltage which is typically between 30 to 100V. When first striking the arc the full open circuit voltage is applied between the welding rod and the earth clamp. I’d suggest that ECU damage is most likely when first striking the arc and not during steady DC current flow. You might argue that adequate earthing will maintain the body at zero potential throughout. Ohm’s law tells us that if current is flowing there must be voltage regardless of your earthing. Further, earthing does not control the resistance through the body and thus does not necessarily prevent potentially large voltage drops. From this evaluation it is confirmed that welding a vehicle does risk damage to the ECU and disconnecting the battery’s negative terminal will mitigate that risk. The problem lies with the ECU and the welder sharing a single conductor – the vehicle’s body. For the welder to push current through the body, it must impose a voltage across it regardless of how good your earthing is (Ohm’s law). With the battery connected there is a closed electrical loop where the voltage across the vehicle’s body could add to the battery’s voltage and cause an overvoltage condition at the ECU. With the battery’s negative terminal disconnected, the loop is broken, both terminals of the ECU will float to the same voltage and no overvoltage will occur regardless of the voltage across the vehicle’s body. – Disconnect the battery’s negative terminal. This breaks the loop through the battery so that possible overvoltages are reduced. – Place the welder’s earth as close as possible to your welding work. This minimizes the amount of conductor that is being shared with the ECU and other electronic devices. – Disconnect airbag connectors. Even with the battery’s negative terminal disconnected, there are still minor parallel paths throughout the electrical system that could induce a small voltage. Although this is unlikely to fry electronics it could trigger the airbags. – With the battery’s negative terminal disconnected the risk of overvoltage is almost eliminated, although not completey (as described in the point above). If you want total piece of mind then you need to completely disconnect the ECU. That being said, why would you weld by hooking your welder’s ground strap to the battery ground and then weld on the body ground wire going to the ECU. If you weld on the bumper, ground to the bumper. If you weld the exhaust, ground the exhaust. Don’t cross weld. Using KVL – Welding current in from ground strap, goes through the material to the electrode. There is no other return path for the electrons to go then there is no problem. If there is any ground or a battery charger or something then all bets are off. If you ground the frame and weld the exhaust then yes, current is going to go through the O2 sensor to the ECU – BAD! Hey Rob not sure what your point is, can you explain? The analysis above demonstrates that no matter where you ground, there is risk of voltage rise at the ECU. It’s got nothing to do with welding on the ground wire going to the ECU. If you ground the bumper and weld the bumper there is a parallel path for current to flow through the rest of the car which can raise the voltage across the ECU. To mitigate the risk disconnect the battery and ground as close as you can to the welding work. Grounding as close as you can to the welding work minimises the resistance from welding electrode to ground and minimises (but does not eliminate) the current flowing through alternative parallel routes. Well Joe; Riddle me this, my friend welded a hitch onto a 2006 Explorer and the next day the transmission fried! We installed a new transmission and it was fine for 1.5 years until he welded a push bar on the front and the next day the transmission fried again? Now he just welded exhaust onto a 2005 Nissan Titan and the next day the engine has lost all power and will barely run! I was taught and still claim that if you do not unhook the battery, you can cause damage to electrical components. Now as to all your electrical schematics showing how welding does not hurt, I am an Engineer and I can show you all kinds of formulas indicating that a Bumble Bee cannot fly, but nobody as of yet has informed the bees of this! Bugger when is your mate gonna learn to disconnect the battery? Three times is enough! Disconnecting negative terminal minimize risk but doesn’t mean that positive path is in the clean air. There is still possibility that some small load make a loop to the chassis. Hi dmz if the negative terminal is disconnected there is no return path for current. No current can flow. Think about it. Muffler Shops have been gas brazing the pipes from way back in the early automotive days. Plus those big lifts must ground car a lot better than jack stands or blocks or car tires. I have been told Static Electricity can kill an alternator, plus always disconnect the negative battery cable first. The diagram on the left in the article above does not show the line from battery negative to ECU negative. Yeah it does. It’s through the resistor. The connection is not zero resistance. That’s the source of the problem actually. Does clamping a surge protector to battery clamp help ? With or without behind connected ? Hi Dan it might help. But maybe not, because the surge protector is usually connected directly across the battery. 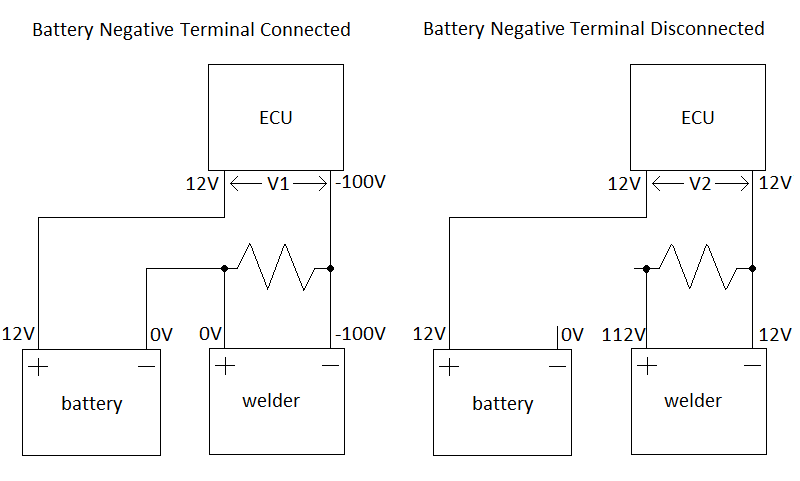 See in the circuit diagrams the battery is only 12V but the voltage from the welder can add to the battery voltage. So unless the surge protector negative is installed near the welding work it may not make any difference.